In the Southern Hemisphere: Tropical cyclone (tc) 23s (Wallace), located approximately 833 nm northwest of Learmont7, Australia, is tracking west-southwestward at 09 knots. Iran – Update – Iran moved on Saturday to evacuate more towns and villages threatened by floods after continued rain in the southwest of the country, state television reported, as the nationwide toll from the flooding reached 70. Iran – Update – Iran has ordered the evacuation of about 70 villages in the south-western province of Khuzestan due to a growing risk of floods. The orders come as Foreign Minister Javad Zarif accused US sanctions of impeding aid efforts to affected areas. US sanctions imposed after President Donald Trump withdrew from the Iran nuclear deal last year have caused a shortage of rescue helicopters. Storms forecast for the coming days are predicted to affect the west and southwest of the country. Tens of thousands of people have already been displaced, with many being housed in emergency shelter, according to state media. Iran – Update – At least 45 people have been killed since March 19, according to official figures, in floods that swept northern, central, and southern Iran and spread to western and southwestern parts of the country in recent days. Thousands of people from scores of villages and towns have been evacuated across the country as forecasters predicted more heavy rains in the next two days. More than 25,000 homes were destroyed and over 60,000 damaged during the floods. In the Southern Hemisphere: Tropical cyclone (tc) 21s (Veronica), located approximately 123 nm northeast of Learmonth, Australia, is tracking southwestward at 08 knots. Tropical cyclone 22s (Joaninha), located approximately 45 nm east-northeast of Port Mathurin, Mauritius, is tracking east-southeastward at 06 knots. Iran – At least 18 people were killed and around 100 others were wounded in flash floods in Iran’s southern province of Fars, Iran’s semi-official Tasnim news agency reported on Monday, following devastating floods in the north. State TV said several provinces were also on high alert for more imminent flooding because of heavy rain. In the Southern Hemisphere: Tropical cyclone (tc) 21s (Veronica), located approximately 203 nm northeast of Learmonth, Australia, is tracking west-northwestward at 04 knots. Tropical cyclone 22s (Joaninha), located approximately 331 nm east-northeast of Port Louis, Mauritius, is tracking east-southeastward at 06 knots. 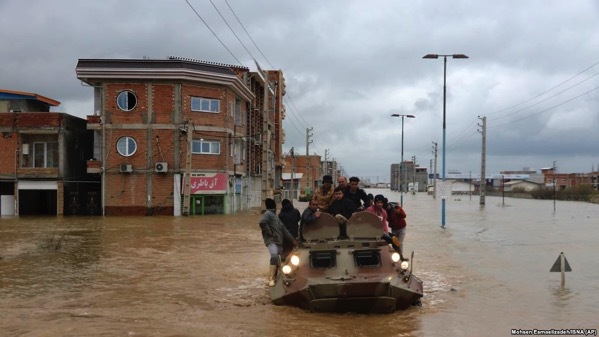 Iran – Massive floods in northern Iran over the weekend were so severe that the armed forces and Islamic Revolutionary Guard Corps were deployed to deal with the crisis. Up to 400 villages in Golestan and 200 in Mazandaran were reported to be without power. Some of the villages received assistance in recent days, and 7,000 people were said to have received emergency accommodations. Australia – Veronica was a category four on Saturday before making landfall on Sunday, bringing destructive winds that downed trees and damaged roofs, heavy rain that caused flooding and a storm surge that eroded beaches. 5.2 earthquake hits the Molucca Sea. 5.2 earthquake hits the Myanmar-India border. 5.1 earthquake hits the Ryukyu Islands off Japan. 6.4 earthquake hits the Molucca Sea. 5.7 earthquake hits the Iran-Iraq border. 5.5 earthquake hits Mindanao in the Philippines. 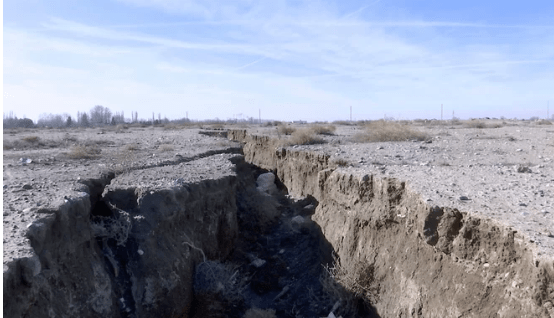 5.4 earthquake hits southern Xinjiang, China. 5.0 earthquake hits southern Peru. Three 5.0 earthquakes hit the Molucca Sea. 5.0 earthquake hits the Azores. 5.4 earthquake hits the southwestern Atlantic Ocean. 5.1 earthquake hits southeastern Iran. In the Atlantic Ocean: Tropical Storm Leslie is located about 800 mi…1290 km ene of Bermuda and about 1365 mi…2195 km w of the Azores with maximum sustained winds…60 mph…95 km/h. Present movement…e or 95 degrees at 12 mph…19 km/h. Tropical Depression Fourteen is located about 90 mi…150 km e of Chetumal Mexico and about 260 mi…420 km ssw of the western tip of Cuba with maximum sustained winds…35 mph…55 km/h. Present movement…nnw or 340 degrees at 3 mph…6 km/h. In the Eastern Pacific Ocean: Hurricane Sergio is located about 1205 mi…1935 km wsw of the southern tip of Baja California with maximum sustained winds…115 mph…185 km/h. Present movement…w or 270 degrees at 8 mph…13 km/h. In the Western Pacific Ocean: Tropical Storm 30w (Kong-Rey), located approximately 196 nm west of Misawa, Japan, is tracking east-northeastward at 29 knots. Central America – Heavy rain has lashed parts of Central America and has led to flash flooding and landslides. Two tropical disturbances, one in the eastern Pacific and one in the Caribbean, are close enough to each other and are enhancing the tropical showers over Costa Rica, Nicaragua, Honduras and Guatemala. Total rainfall over the region has averaged between 50 and 100mm daily over the last several days. More heavy rain is expected in the next 48 hours, particularly for western Nicaragua where over 250mm of rain is expected. Iran – At least 4 people have been killed due to floods ravaging Iran’s northern province of Mazandaran since late Friday. Three people drowned, while another victim was killed by a lightning strike, Tasnim news agency reported. The disaster also damaged buildings and cut electricity in some parts of Mazandaran. Over the past two days, four provinces of Mazandaran, Gilan, Ardabil, and West Azarbaijan were hit by floods. 6.2 earthquake hits the Mariana Islands. 5.4 earthquake hits Antofagasta, Chile. 5.3 earthquake hit southern Iran. 5.3 earthquake hits offshore Antofagasta, Chile. 5.3 earthquake hits the Ryukyu Islands off Japan. 5.2 earthquake hits the Dominican Republic. 5.1 earthquake hits the western Indian-Antarctic ridge. 5.0 earthquake hits the Banda Sea. 5.8 earthquake hits Atacama, Chile. 5.6 earthquake hits the Panama – Columbia border. 5.3 earthquake hits south-eastern Iran. 5.0 earthquake hits the Kermedec Islands, New Zealand. 6.2 earthquake hits western Iran. 6.0 earthquake hits the Fox Islands in the Aleutian Islands. 5.0 earthquake hits the Bonin Islands, Japan. 5.8 earthquake hits western Iran. 5.7 earthquake hits the central mid-Atlantic Ridge. 5.6 earthquake hits eastern Iran. 5.6 earthquake hits Kepulauan Sangihe, Indonesia. 5.5 earthquake hits the island of Hawaii, Hawaii. 5.2 earthquake hits the Revilla Gigedo Islands. 5.1 earthquake hits Veracruz, Mexico. 5.0 earthquake hits the Gulf of Aden.